If you’re anything like me then you will probably spend all day trying to find time to write. Then, when you finally get a couple of hours you can devote to your story, you find a million other things to do instead. To prove my point, here is a graph I created when I should have been writing. It describes how I allocate my time during a typical 2 hour writing session. I have the room to myself, everyone else is busy doing their own thing, the computer is mine, so why am I not writing? I know exactly how you feel – in fact I today wrote a post on pretty much the same thing, complete with my own version of a time-wasting graph! Stuff like that weirds me out, but is comforting to know you’re not the only one I guess. 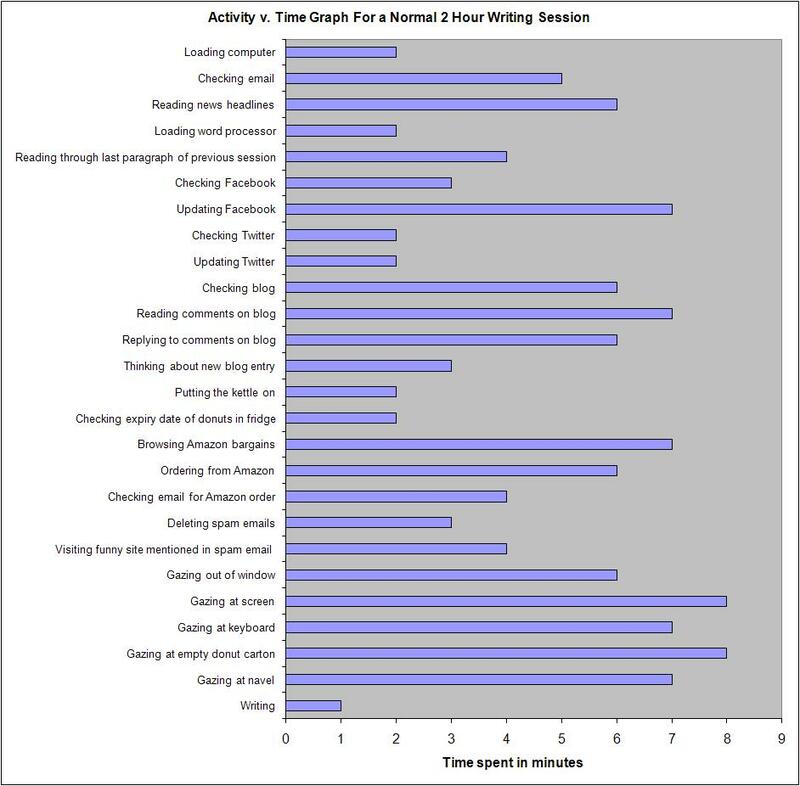 Good luck with the less-graph-making-more-writing time. Hi Lynsey. I just popped over to your blog, and what’s even weirder is that I was orginally planning to use a graph similar to the one you used, but changed my mind and opted for the bar graph. No way! That is strange. Yep, those minutes do add up to exactly two hours. What’s interesting here is that I originally sat down this morning to update my Beyond the Charts website and put some more products on it, but instead I’m doing everything else. Why is it we do these other things when we have decided to do the very tasks that would be more beneficial to us? And the other night I was in the mood for writing and I let my wife get on the computer some so I wouldn’t hog it from her since I’d already been on for a while. Once she got off, it was late and I didn’t feel like plunging in any more.